Bonn, 13 December 2016 - An AEWA Workshop to develop an International Single Species Action Plan (ISSAP) for the conservation of the Dalmatian Pelican (Pelecanus crispus) took place in Lithotopos, Greece from 22 to 24 November. More than 30 participants from 12 countries met to discuss status, distribution, threats and conservation issues in key Range States of the Dalmatian Pelican. The aim was to identify the goal and objectives of an ISSAP and to build the corresponding action framework. Participants were also informed about the next steps and schedule of drafting, reviewing and completing the draft Action Plan before submitting it for approval by MOP7 in 2018. The Dalmatian Pelican is considered by many as a particularly striking migratory waterbird species, characterized by its silvery-white plumage, red pouch and yellow-orange skin around its eyes. Dalmatian Pelicans are facing several human-induced and natural pressures. They are affected by drainage and habitat degradation, disturbance, persecution and effects of climate change such as drought and floods. Globally, the Dalmatian Pelican has three populations, two of which will be covered in the ISSAP: the South-east European, concentrated on the Balkans, and the West Asian population. After reviewing the status of the two populations, workshop participants discussed appropriate conservation activities. Even though the South-east European population displays no apparent critical trend and is even on the rise, it is conservation action dependent. Half its breeding population is concentrated in one single colony in Lake Prespa in Greece, and the rest is spread through a limited number of other smaller colonies, making the entire population vulnerable and susceptible to stochastic events. Workshop participants agreed that it is necessary to increase the number of colonies. To increase the population’s breeding success and establish new colonies, good practice that has already been established is the building of breeding platforms on stilts or floating rafts. The West Asian population is larger than its South-east European counterpart, but clear numbers are lacking. There are no reliable data on its breeding pairs, overall population estimate nor on the population’s migration routes. More specific knowledge about this population is required in order to advance and improve conservation planning. With substantial population declines occurring during the 19th and 20th centuries, the Dalmatian Pelican is classified as Vulnerable on the IUCN Red List and is protected under CMS, CITES and the Bern Convention as well as the European Birds Directive. Since the 17th century, 80 per cent of its breeding sites have disappeared. Today, its presence in Europe is limited to only 13 wetlands of the Balkans and the Caucasus. Wetlands are some of the world’s most biologically diverse yet fragile ecosystems. 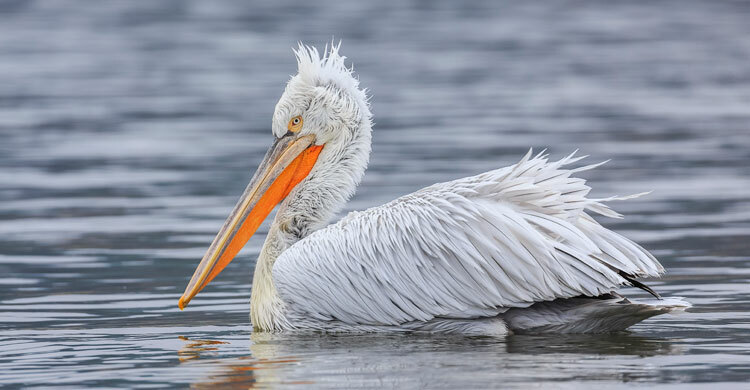 Without continued conservation efforts, the decline of breeding sites will eventually cause the total disappearance of the Dalmatian Pelicans from the Mediterranean Basin. The workshop was kindly hosted by the Greek Ministry of Environment and Energy, and organized by the Hellenic Ornithological Society and the Society for the Protection of Prespa. The Single Species Action Plansis being developed in the framework of the EU LIFE EuroSAP project (LIFE14 PRE/UK/000002) which is being coordinated by BirdLife International with funding support provided by the European Commission and the Italian Ministry for the Environment, Land and Sea. Mr. Sergey Dereliev, AEWA’s Technical Officer, facilitated the Action Planning Workshop. On the last day the group went on a field trip to Lake Kerkini National Park hosted and guided by the national park’s management authority. The group visited one of the pelicans’ winter roost sites at Lake Kerkini. Participants were taken on boats close to the artificial island and the stilted platform which were built at the site. As a result of this action, a breeding colony was established at Lake Kerkini for first time, which now amounts to more than 200 pairs.